FINALLY – a wash mitt specifically for rinseless washes! The specialized open ended fibers that make up the Ultra Soft Microfiber Rinseless Wash Mitt are used to trap dirt and dust and safely remove it from the surface. The open ended fibers create less friction than a normal looped fiber found on most towels; less friction = reduced chance of inducing swirl marks! 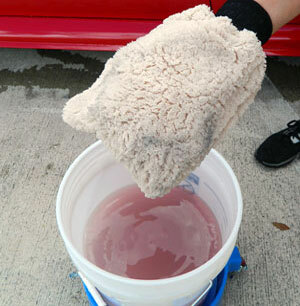 The Ultra Soft Microfiber Rinseless Wash Mitt was brought in to settle a heated debate amongst Autogeek employees here. 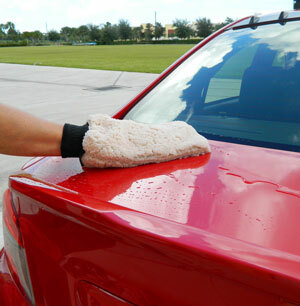 Half of the staff argued that the best tool to use when using a rinseless wash is a super soft microfiber towel, so as not to mar or scratch the paint. The other half insisted that a wash mitt is MUCH more effective since it can both grab the contaminants safely, and scrub away stubborn spots. Both sides of that argument were taken into account and the Ultra Soft Rinseless Microfiber Rinseless Wash Mitt was born. The super soft fibers used in the make-up of the Ultra Soft Microfiber Rinseless Wash Mitt are not looped; meaning that they can more effectively grab and trap dirt and dust and safely remove them from the surface. When paired with a rinseless wash, like Pinnacle Liquid Gloss Rinseless Wash with Carnauba, your paint will be clean and clear without virtually ever spilling a drop of water. The open ended fibers are also quick to release built up dirt when rubbed against your Grit Guard, allowing you to work quickly without fear of contamination from previous panels. The Ultra Soft Microfiber Rinseless Wash Mitt can be washed normally with your other microfiber products, in a dedicated microfiber wash. The Ultra Soft Microfiber Rinseless Wash Mitt features a durable, elastic cuff that keeps the mitt securely in place, as well as an attached loop for hang drying. The quality lining is also durable and will not disintegrate after being exposed to water. When starting a rinseless wash detail, fully submerge your Ultra Soft Microfiber Rinseless Wash Mitt in your solution for total saturation. Once fully saturated, your Ultra Soft Microfiber Rinseless Wash Mitt will glide effortlessly over paint, grabbing dirt and dust and leaving the surface clean. 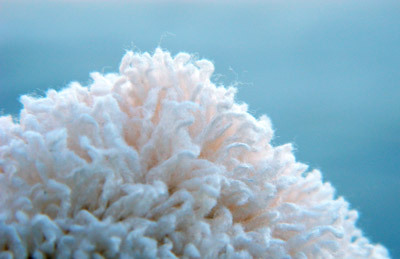 The open ended fibers of the Ultra Soft Microfiber Rinseless Wash Mitt grab and trap dirt from the surface. These same open ended fibers also quickly release the dirt that was trapped, giving you a clean mitt after rinsing and reducing the risk of contamination on new panels. A quality wash mitt is not something you want to skip when doing a waterless/rinseless wash; use the Ultra Soft Microfiber Rinseless Wash Mitt for the safest and best wash imaginable. Mine did not come with the loop for air drying the mitt. Ended up getting one as a free girt with one of my orders last year. I bought two more shortly after and they are the only ones I use. I detail on the side and these have held up well. I purchased two, one for wheels and one for paint. 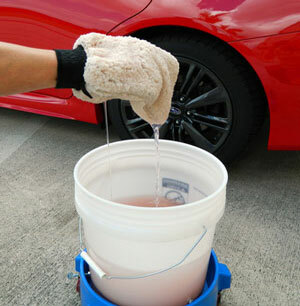 I like the mitt because it scrubs two sides when washing wheels reducing cleaning time. ConsStained first time I used it on wheels but that was to be expected. I first tried this for rinseless wash using ONR wash & wax on a well maintained & coated lightly dirty car with 2 bucket method. 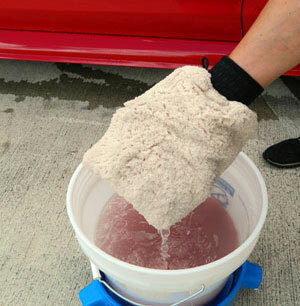 I found dirt discoloration in the mitt that would not rinse out of the mitt before I was able to finish the car. After wash inspection did not reveal any swirls but I lost confidence in using one mitt to do an entire rinseless wash. I went back to using about 10 microfiber towels folded into quarters and use this mitt to do a second pass after the panel was washed with a towel. Overall it is a good quality soft mitt and all the dirt / discoloration was removed after a spin in the washing machine. I would recommend buying a few mitts and switching to a fresh one when all the dirt no longer rinses out. ConsDirt embedded in mitt may scratch finish if it is the only one used for a rinseless wash.